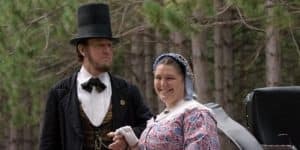 You’ll feel like you’re traveling back in time to the 1860s to meet President Abraham Lincoln and his wife Mary Todd Lincoln in this wonderful reenactment called The Lincolns Present: The Genesis of the Gettysburg Address. Through the amazing skills of historical presenters Max and Donna Daniels, the Elmhurst History Museum brings the Lincolns to life on Sunday, Feb. 11 at 2 p.m. All of us at Elmhurst Toyota encourage you to attend this unique, family-friendly event that offers a fascinating glimpse into a pivotal time in U.S. history. The date of the event is significant because you’ll see the Lincolns as they were on Feb. 11, 1863 — exactly 155 years ago. It was the day before Lincoln’s birthday (Feb. 12) that the genesis for the Gettysburg Address occurred. Following the reenactment, you can ask the Lincolns questions in a Q&A session and take photos with them. Children in attendance can try writing with a steel-tipped pen and inkwell, just as Lincoln did. You’ll go behind the scenes in the nation’s capital with President and Mrs. Lincoln to learn more about the origins of the Gettysburg Address and the time in which the Lincolns lived in the White House. In 1863, the American Civil War had been raging for two years. The Gettysburg Address was given later that same year on Nov. 19, 1863. The occasion was the dedication ceremony of the new Soldiers’ National Cemetery in Gettysburg, Pennsylvania. The site marked a decisive victory for the Union Army against the Confederate soldiers at the Battle of Gettysburg. While at The Lincolns Present: The Genesis of the Gettysburg Address, you can see an actual, handwritten copy of the Gettysburg Address complete with President Lincoln’s notes. This important piece of history is on display as part of the Elmhurst History Museum’s Freedom: A History of US exhibition. It runs through March 11 and contains many other historical documents that are a testament to the freedoms that Americans fought for since 1776. Don’t miss this opportunity to meet with first person historical presenters Max and Donna Daniels as they bring President and Mrs. Lincoln to Elmhurst. Reserve your seats now–advance registration is required. Sunday, Feb. 11, 2018, 2 p.m. Admission is free for museum members and $5 for nonmembers. Registration is required online at Eventbrite. Call 630-833-1457, 630-530-6879 or visit www.elmhursthistory.org.